The Hunger Games is not real. (gasp) I know. Stunning. This dystopian world in which children are sent into an arena to fight to the death is, in fact, fictional, imaginary, fantastical. And you know what that means. That means that the appearances of the characters therein are also not real. That is, they are subject to the imagination of the reader. 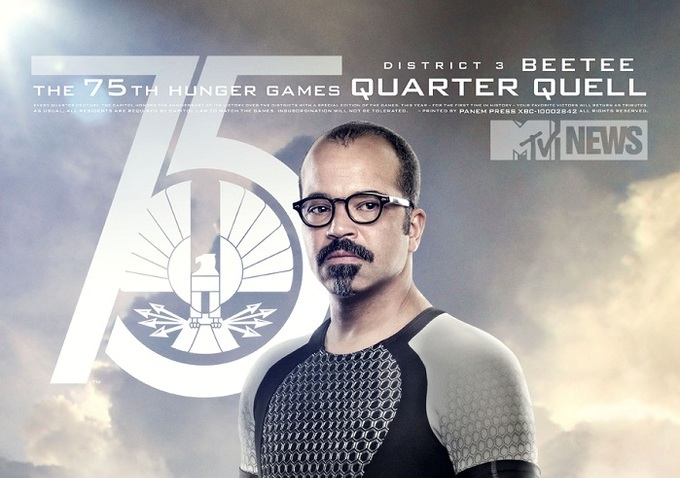 Katniss is described as “olive-skinned,” which can be interpreted semi-loosely, but Beetee? He was merely described as having “ashen skin” and black hair. Lots to play with there. Right? It’s a book. He looks different to all of us in our heads. 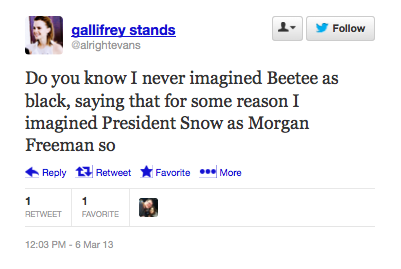 It is difficult to imagine benevolent geniuses as black, it seems, but quite easy to imagine villains as black. This is telling, isn’t it? Telling that the white imagination, when provided in a book with descriptions of a “good guy”—intelligent, valuable, kind, even gentle—imagines that character as white (like themselves) but when provided with descriptions of a villain, a killer, a dangerous maniac…imagines that character as a black man. Morgan Freeman. Who has overwhelmingly portrayed “good” characters in his career as an actor. He even played God once, if memory serves. What is it, then, that causes the white imagination to provide his face as a stand-in for what they imagine as a ruthless child killer in a fictional world? His blackness. And only that. As white people, we are used to representations of ourselves crowding the covers of magazines, crowning the posters of newly released films. The good guys are white, we have learned, after eons of our faces being plastered under cowboy hats and in impeccable Bond suits. White men are Superman, we have learned. White men are Ethan Hunt and Neo and white men are hobbits. Bad men, we have learned, are black. They’re gang bangers and thugs and talk loud and sometimes deliver funny lines where we laugh at their Otherness. Black men aren’t heroes, we learn. Our imagination and subconscious are so saturated with white supremacist notions of goodness, beauty, and heroism, that when confronted head-on with an image of a black man who is brilliant and kind and normal and who saves the day, we transform into robotic versions of ourselves: Does…not…compute. Hero…must be…white. It’s this line of thinking that turned Disney’s Princess Tiana into an animal for 95% of the movie. The collective white imagination had difficulty imagining a black girl as a princess…and so she became a frog. This isn’t about staying true to the book. Suzanne Collins was vague (I believe purposefully so) with the descriptions of her characters, so when we say “I didn’t picture Rue as black,” or “No, Beetee was white,” it is not the text that is leading us. We’re following a different illogical path of logic, one in which everything we believe about ourselves as white heroes and heroines is being contradicted. The notions taught by patriarchy and white supremacy do not only effect our day-to-day encounters in reality; they shape our imaginations and our expectations, our intangible realities. But unlike the tributes who enter the arena in The Hunger Games, we have a choice. We can choose. We can choose to step aside on what we’ve been taught is our pedestal of greatness and acknowledge that there is room for more. We can choose to transform our ideas of heroes and who can be good, and kind, and brave. The alternative is bleak. If even our imaginations are irrevocably bound to what patriarchal and white supremacist doctrines prescribe, then we’re in trouble. The moment we kill the thing in us that imagines change and difference and growth is the moment we kill any hope of a better world. The world in The Hunger Games may not be “better,” but how much worse is it really when it can imagine a genius hero who is black…and we can’t? Race-themed. When I think of race as a theme in film, I think of it as the way theme is defined. Here’s how Merriam-Webster defines it. “The main subject that is being discussed in a piece of writing, a movie, etc.” Themes are what a film is about. If a film is race-themed, then it is about race. So imagine my surprise when I saw USAToday describe The Best Man Holiday as race-themed. Forget “race-themed”: I struggle to see how the film is about race at all. Like its predecessor, Holiday focuses on the intertwining lives of a group of men and women: authors, football players, mothers, fathers. It’s about the bond of friendship and the tests of its strength. Financial worry. Parenthood. Marriage. Grief. Forgiveness. But what exactly does race have to do with grief aside from the fact that, in this instance, the people struggling with grief are black? What USAToday’s tweet reveals is that white audiences are unable to see black people as beings separate from their blackness. A movie featuring a black cast surely can’t be about universal themes that any audience can relate to, this line of thinking goes: the subject matter must be about mysterious black things that only black viewers can comprehend; it must be black inside-jokes; black references; black experiences. Black movies are for black people—not for everyone. 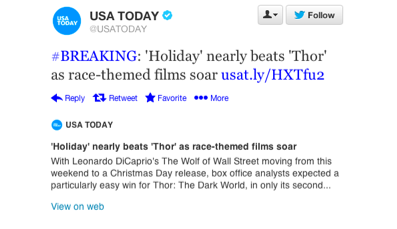 Black people are defined by their blackness and so are their films, and USAToday’s tweet tells us that explicitly. Every day we are bombarded with movies and television shows in which white faces, white families, white marriages are plugged as the “default” experience…and no one would say that these films are about race. No one would say, “Oh, that’s an all-white cast. It must be about what it means to be white in America.” No one. Black audiences go see these films, despite their almost entirely white casts, because if black audiences only went to see films in which the cast looked like them, they’d see maybe five movies a year in mainstream theaters. Tops. Why not the same for white folks? Why was I the only white person in the theater for Best Man Holiday today? What is it about a black cast that is off-putting to white audiences? Do we really need to see ourselves reflected endlessly back at us to enjoy a film? Why did white audiences flock to see Django and 12 Years but not Holiday? Why can you relate more to a film about chattel slavery than you can about nine affluent people and their families? These are questions that need answers. 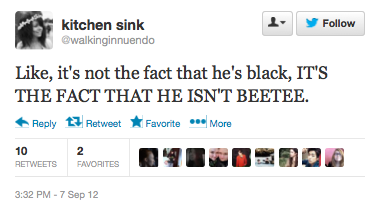 This is not to say that films with black casts are never race-themed. Of course they are. If a film is about race, then it’s about race. But Best Man Holiday is not. A film’s themes do not become about race simply because its cast is not white. Not only does this notion bind black actors to their blackness, it Others non-white experiences, casting white films as default, and everything else as “everything else.” Films with white casts are then provided with the benefit of universality: free to be any genre, take on any subject matter or theme. A film with a black cast, no matter its story, is “race-themed,” tied to the race of its actors simply by virtue of their blackness. If we describe Best Man Holiday as “race-themed” we must ask ourselves the following questions. Because these are the things that Holiday is truly about. Universal lessons of brotherhood and faith, the tests of love and the frailty of the human heart: these things are no more about race than love itself. To say this film is about race tells black actors—and black audiences—that no matter their experiences, their heartbreaks, their vows, their tribulations…at the end of the day, before they are human, they are black. This violent oversimplification of black roles not only dehumanizes black lives, but it perpetuates in white people the idea of their Defaultness and the lie that all experiences are relatable through whiteness. We’ve all had our hearts broken. We’ve all been in love. We’ve all had a best friend at some point in their lives. How stunted is your imagination, how crippled is your notion of life, if the people on screen with broken hearts, the people in love, the people mending their friendships, have to look like you in order for you to feel a connection with their humanity? This blog actually is race-themed. Sure. I’ve done it. We’ve all done it. But it’s not always possible. When an artist is so much in their work—whether the presence is conscious or unconscious—it becomes difficult to ignore. It’s distracting. 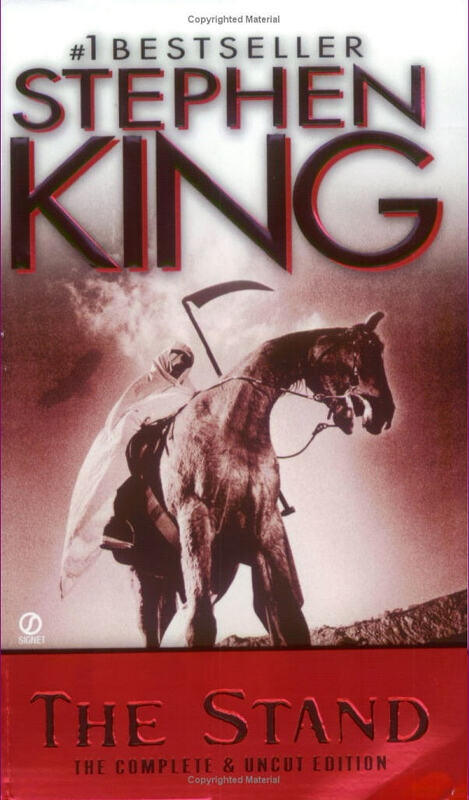 Five minutes ago I finished reading Stephen King’s The Stand. And, to quote a friend, the “religiosity” became “hokey.” But more distracting than that was the subtle racism. The Satan-esque villain known as “the black man.” The black soldiers being enormous and muscle-bound and barely human. The complete absence of “good” black characters with the exception of the religious, cornbread-baking prophet woman. The ending, with Africans carrying spears and falling dumbly down at Flagg’s feet (the book took place in the ‘90s). And don’t get me started on the female characters. What else can I say besides the fact that it’s tiresome? I realize it was written in the 70’s. And that’s always the excuse of people who defend this and other writing. “Well that was then; there weren’t black main characters back then,” as if it was the Stone Age. As if this means it is exempt from criticism. It’s not. Stephen King wasn’t employing these metaphors for literary effect. It’s casual. Included by way of his own subconscious notions. If this were purely a thing of the past and a pattern not present in 90% of popular fiction and film, maybe it would be easier to lay the old dog to rest. But that dog is barking, and it only makes it worse to read this puffed-up book from the 70’s and see how little has changed.